Friday already, this week sure has gone very quickly. Tonight we are showcasing Mags gorgeous box she has made using the Cameo Cog designed by Kath Halstead. You can expect to see more of Kath's designs this year. Why not check out Mags blog for yourselves to see her fabulous creations. The Cameo Cog along with other Steampunk designs can be purchased here. Tonight we have a beautiful revamped Christmas box that Christine has breathed new life into. Why not hop on over to Christine's blog to see more of her amazing creations. 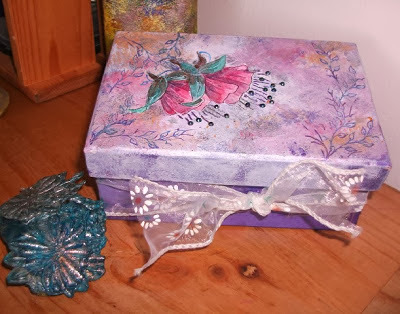 Christine has used our Fushia Decoupage Stamp. We all think this is fabulous and a great idea too. You can purchase this stamp here. Today we are showcasing a beautiful watercoloured card by Kath, why not visit her blog to see more of her amazing creations. 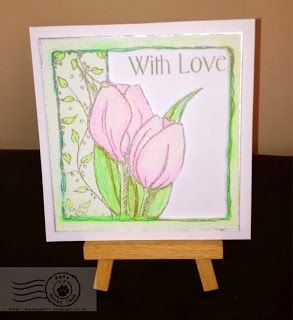 Kath has used the Tulip Decoupage stamp set which you can purchase here along with other fabulous products.